To obtain a marriage license, you need to know the requirements for the state you are getting married in. Here are the easy steps to getting legally wed in Oregon. Step 1: Visit your county Clerk’s office. You can go to any County Clerks office in the state if you plan to get married anywhere in Oregon. You have to appear together to apply for a marriage license . If you are getting married anywhere in Oregon and you work in Portland, you can meet on your lunch break, go to the Multnomah County office, fill out the form and prove your identity. The standard fee is $60 (may vary for different states and county offices). Some will accept a certified check, debit or credit cards and cash, they will not accept personal checks, please check before you go. It’s important to note the timing of applying for your marriage license. There is usually a 3 day waiting period in Oregon. Once your license application is approved you have 60 days to make it official. If you are getting married in Washington or any other state you have to apply for a marriage license in that state. You cannot use an Oregon Marriage License in another state. Step 2: Get married. You must have an official present to officiate your ceremony. You will want two witnesses, in addition to your officiant. If you are eloping, you may use your vendors as a witness, but make sure you ask them in advance. Traditionally the Best Man and Maid/Matron of Honor serve as your witnesses. Step 3: Your officiant is responsible for submitting the official marriage certificate to the County Office in a timely manor. You will be given a decorative, non-official certificate when you apply for your marriage license, and sometimes your officiant has their own ornate certificate – none of these are your legal documentation for official purposes. These are keepsakes only. Step 4: After your official documentation is submitted by your officiant and confirmed by the state, you will be able to order certified copies from your County office. In Multnomah County the cost is $7.95. We recommend you order at least 1 certified copy for your records and from 3 to 4 copies if one or both of you plan on changing your legal name. You’ll want to be able to mail copies while retaining a copy during the process of changing your ID and documents. So that brings us to part two of making it legal – how do you change your name legally? Step 1: Obtain certified copies of your marriage certificate. Step 3: Go to the DMV – it will be a long wait. Bring your certified marriage certificate and proof of address if your address has changed. Step 5: Change your bank account, notify your employer and all accounts. Step 6: Let everyone else know. If this doesn’t sound fun, you can use a service, such as Hitch Switch, but it truly isn’t a ton of work and if you just update your accounts with every interaction you have as you go – you’ll get there before you know it. There are many reasons couples turn to a friend or loved one to officiate their wedding: They don’t belong to a specific church or feel attached to a specific clergy member; our kids’ fourth birthdays are a big spectacle why wouldn’t our wedding ceremony be something to remember and completely unique; it only takes a few minutes to become ordained online; and couples enjoy having their ceremonies in very non-traditional personally meaningful ways. While we are certain your best friend is going to be just great at this, we’re also betting they may not have done this before. 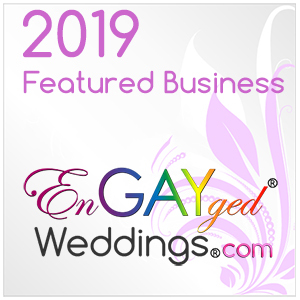 Even if you don’t want or need a professional officiant, we highly recommend you turn to a professional to help you write and plan your ceremony. Personalized ceremonies are our favorite, but they can also be the absolute WORST! There is nothing more embarrassing than a wedding where the bride and groom clearly worked on their own or with a planner to create an amazing and unique reception experience for them and their guests, but they failed to pay the same attention to detail in planning their ceremony. Sure, the couple knew where they wanted to stand, the decor, even the chairs are comfortably fantastic, and the processional and recessional music Had guests dancing in their seats or crying tears of joy, but what about the ceremony? What’s in a ceremony? Do you have to pledge obedience or other creepy antiquated ideals of a sexist past you’d like to not participate in? Of course not! Writing and poetry are not every person’s strong suit. Even if you as a couple are determined to write every word of your vows yourself, what about the other parts of the ceremony? Your friend may be brilliant, an excellent public speaker, or even a writer, but are they going to write your perfect ceremony from start to finish? What readings or traditions will you include? What would you like to keep out completely? This is why hiring a wedding planner can help you in ways you may not have even considered. You thought they were just going to arrange who stood where, but no, your modern planner is also an ordained minister (remember it only takes a few minutes online and come on when we say we are ready to solve any problem that may arise, that includes being ready to officiate because it was the plan all along or because your officiant got caught in traffic between weddings). We are experts, we won’t let you forget a single detail. And most importantly, at Vareus Events and other modern planning firms, you can turn to an expert just to help you craft the perfect custom ceremony plug in the parts from your friend – the officiant, and your personalized vows. It’s stress free, and more importantly it will be the part you most look forward to. Our Vareus Events Custom ceremonies start at $200. For $500 you get a custom ceremony, an officiant, and a rehearsal. As part of an existing package, writing and planning services may already be included. Our full service planning packages always include a planner as an emergency back up officiant – where local laws allow (void in some states or counties). Many Modern couples are opting to get married in a courthouse with just a handful of people, or elope somewhere non-traditional and special to them, in lieu of a large church ceremony. Millennials do not have the same attachment to a Church their parents or GenXers may have had, so a religious ceremony is not a necessity. There are a lot of pluses to feeling free to marry exactly how and where you want to. For starters, we are big believers that the Wedding Ceremony, itself, is the most important thing about your upcoming nuptials. Why? Because your promises made to each other are truly what this is all about. What better way to start your life together, than by bringing your absolute true selves out to seal the deal. For some that means a religious ceremony in a house of worship, for others, even if they are deeply faithful, it may mean they have to share this moment in a very different and special way for them. You’re in luck. It is 2017 and you do not have to look at your upcoming marriage as something you have to do in any set way in order to please the world. The question you should ask yourself is how do you stay true to who you are as people in this commitment to each other to become one – and should you sacrifice having the giant party to celebrate even if you don’t want the traditional ceremony? Of course not! You can have it all. Get married in the religious house you love and are an active member of – If you go to Services most weeks, are active in your community and can’t imagine getting married without your religious leader giving the Consecration, then do it! You don’t have to have a traditional reception just because you opt for a traditional ceremony. Think about some venues not too far from where your ceremony will be and plan a day that fits you and your personality. If you worry the formal wedding gown you will wear for your ceremony will not work for the venue you want for your reception, change your close before the Grand Entrance. Brides today are opting to wear traditional or family heirlooms to the ceremony and a different look that is more modern and fun for the reception. Just make it legal – getting married in a courthouse with no big crowds is the perfect way to have a simple ceremony that checks off all the boxes, secures the legality, and makes it all official. If you are a no-nonsense kind of person who really doesn’t want a large ceremony, or to customize your own vows, and add a lot of detail to your ceremony, a Justice of the Peace may be exactly what you need. Many Justices of the Peace will work with you to allow for minor personalizations but they are not typically where you go if you want a unique, completely you ceremony. This may also be a great option for you or your families are very religious, you are not, or your religions do not fit in to your ideas for your marriage. Having an intimate ceremony does not mean you cannot have a huge or traditional reception. Also, some courthouses will even allow for large massive ceremonies so you don’t necessarily have to make this small or intimate. Another great plus, the flexibility. You can get married on a Friday morning and host a massive celebration Friday or even Saturday evening. You can marry on a Tuesday in the town you live in and then fly to your parents’ town for a huge celebration. Get married somewhere that is deeply special to you with only your select few key people around. It can be a destination ceremony. A ceremony at the top of a mountain. You can marry in a park, on a trail, at the Coast, or in your own backyard. It’s really and truly OK to marry wherever you feel it’s right to commit to forever together. Maybe your first trip was to Joshua Tree or Yellowstone and you want to have a small ceremony in the park. Do it! Make sure you abide by Park rules, get the proper permits, and bring along a legally ordained Minister. Also be sure you’re legally marrying by abiding by local laws for getting legally married. Do you need a license (definitely) Do you need witnesses? Is there a waiting period? Do you need a blood test? Plan your special ceremony months to a year in advance and still plan the reception of your dreams. It doesn’t have to take place the same day or in the same town so truly make this completely your dream. We highly recommend you use a professional planner for this type of event. Serious planners and planners who work with non-traditional couples are often ordained Ministers, too – so we can make sure your unique ceremony is legal and done right. Host a large traditional ceremony, even if you don’t belong to a church. You may want everyone you know and love at your ceremony, you may even want religious aspects, or a blending of traditional and non-traditional elements, but you don’t attend weekly services or even feel there is a Church you belong to or would feel welcome or comfortable marrying at. There are many Open Churches. Seriously, this is Portland in 2017! There is no pressure to become a member of many of our area churches, and they will still happily welcome you in to their doors to get married. Even better, some will let you use your own officiant or will just meet with you in a welcoming way, before the wedding, and then happily marry you in a way that makes you feel welcome and comfortable. Some Christian Churches are very excited to have you get married in their Church, and they won’t judge you for blending religious values or doing it your own way. The pluses are they often ask for a reasonable venue rental fee you don’t need a lot of decoration or any chair rentals and they even have a lot of additions like a large organ, lighting and included standard decor or runners. You can spend more on the flowers and less on large decor rentals. Have a large, medium or intimate ceremony at a Vineyard, elegant hotel, on a farm, at a local venue, or rent out an estate for a full day, where you also host your reception. A final idea – a destination wedding. Make sure you use a planner! Professionals like us have contacts everywhere. We can help you secure all the details you want, book rooms for your friends and family, and save you stress, time and money. The key is to have the exact wedding you want. These are just some basic ideas, and truly your options are endless. Think about the exact perfect Wedding for you and then go for it!